Wood Ducks, Nandina, Fungi & Voles, etc. After a month of back-to-back viral infections fever finally abated this week and a follow-up X-ray said pneumonia had finally run its course. It's hard to imagine something invisible through even a high-powered compound microscope can lay a person so low, but viruses are pretty darn good at such things. As we regained a little strength each day this week we traded body fever for cabin fever--the latter the result of being able to do little more than recline in front of a television for 24 days watching shows that never should have been filmed--much less put into syndication. By the end of the first week in February we could stand it no longer and went out to see what was going on in the outside world. A lot was happening, so this week at Hilton Pond Center we decided to put together a small portfolio of nature miscellany we encountered as we strolled--slowly and weakly--around the property. Even though it's barely February, numerous small colonies of Jonquils had pushed up through the leaf litter. 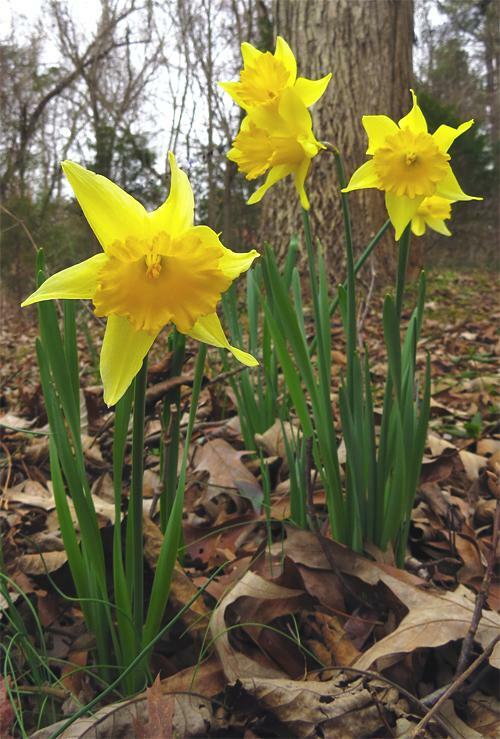 These familiar ornamentals--actually a Narcissus species--came to North America with the earliest settlers who planted them as reminders of homes back in Europe. Jonquil bulbs at the Center were planted who-knows-when by folks who occupied the old farm long before we did. As testimony to Jonquil hardiness, in past years the yellow blossoms of this self-propagating plant have poked above the snow in late January, seemingly unaware that astronomical spring is still months away. Along the trail we found another yellow-flowering plant thriving in what humans might say is "out of season." It was a six-foot-tall evergreen specimen of Mahonia. We only have one of these plants, growing "out of place" on the back side of the dam that forms Hilton Pond. We have no idea how it got there. The spot seems an unlikely one for intentional planting, so perhaps birds brought one of the plant's blue berries in their droppings and gave the shrub a start. We also don't know the species of the individual on the dam. 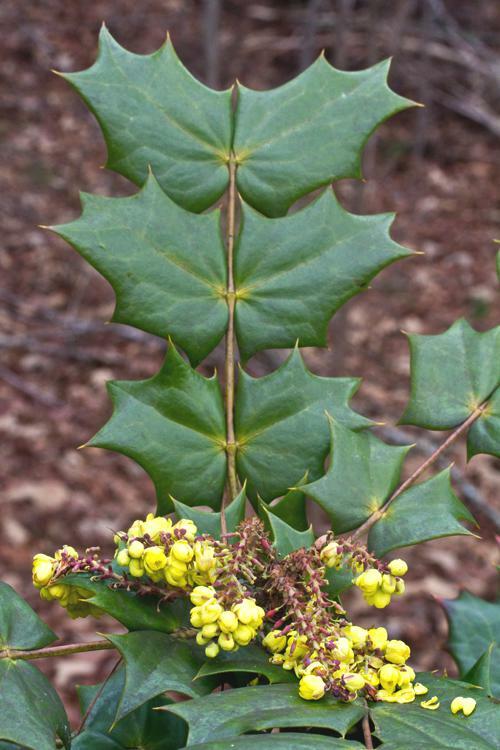 Most visitors who have seen it have called it Oregon Grape, Mahonia aquifolium, but we don't think the leaves have the right shape for that particular native species. Although we'd much prefer to have only natives growing at Hilton Pond Center, we have tolerated seemingly innocuous non-natives like Jonquils and Mahonia. And then there's Nandina domestica, yet another evergreen flowering shrub from Asia. Sometimes called Heavenly Bamboo, Nandina is in the same family as Mahonia (Beriberidaceae) but in our experience grows much more prolifically and is reportedly invasive in some locales. 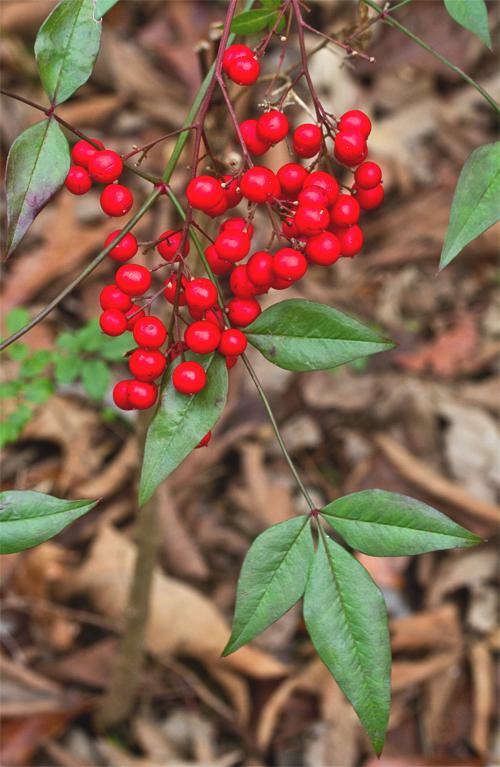 All parts of this plant are at least mildly toxic to humans--they can be fatal for cats and grazing animals--and necropsies done at University of Georgia's vet school showed eating too many Nandina berries can even kill frugivorous birds like Cedar Waxwings via cyanide poisoning. As a result, we have finally decided to eradicate all non-native Nandina plants at Hilton Pond Center, beginning as soon as we can get out the cutting tools. Two pairs of Wood Duck pairs showed up at the Center this week, so despite our feeble condition we carried a stepladder down to Hilton Pond to perform our annual chore of cleaning out the ducks' four nest boxes. This usually simple task turned out to be far more taxing than we anticipated; we got so winded it took two days to complete a task that normally takes two hours. In summary, half the boxes were empty except for small fragments of eggshells. This suggested eggs in those two boxes had hatched and produced Wood Ducklings. The other two boxes were a different story. One had a half dozen or so eggs with shells dirty and brown (see above), and a couple of these were cracked. The other nest box contained at least a dozen eggs--some whole, some crushed--and some almost black in color. Although the third box may have yielded some ducklings, we suspect this last clutch was a complete failure. In past years Eastern Bluebirds and Great Crested Flycatchers nested in our pond-side boxes after the Wood Ducks left, but lots of other organisms also have made use of these artificial cavities. Based on evidence we found this week while throwing out rotten duck eggs and replacing the old wood chips with new, the most common inhabitant last summer must have been paper wasps, Polistes spp. Every Hilton Pond nest box had at least one wasp nest, and one contained a huge colony (above) more than eight inches in diameter. 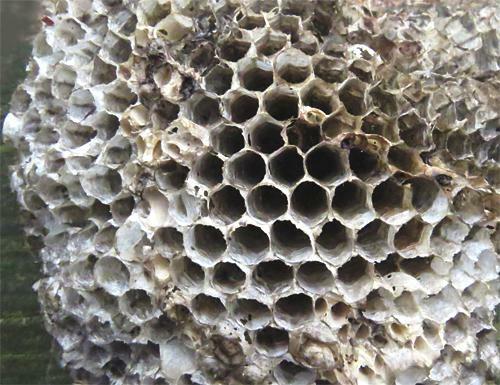 Almost all the hexagonal larval chambers were empty, indicating each could have produced an adult wasp. Males and workers die as cold weather arrives, but the fertilized queen spends winter in some crack or crevice or under loose tree bark, emerging in spring to build a starter nest and lay eggs. 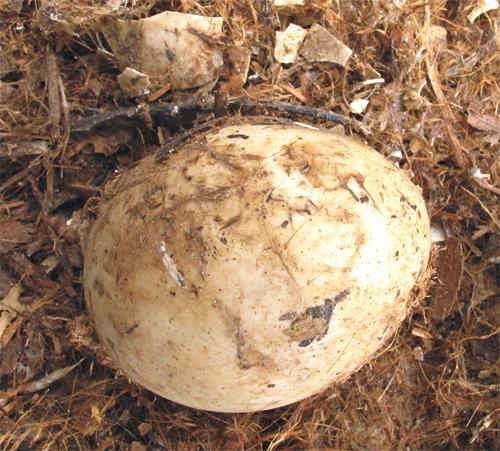 Most eggs hatch into workers that assume the task of enlarging their communal nest by chewing up wood and spitting out paper. And speaking of chewing, when we walked around then pond this week we noticed that yet another Sweetgum tree gnawed on several years ago by an American Beaver had finally toppled into the pond--leaving that tell-tale pointed-pencil stump. When brother Stan Hilton later in the day called to say shrubs in his yard in Batesburg SC had been toppled in similar fashion, we knew because of his location away from big water it couldn't have been beavers. We asked Stan to send us a photo of the damage; he ended up bringing us the whole plant (above). Sure enough, the one-inch diameter trunk looked for all the world like miniature beaver damage. It wasn't beaver gnaw, of course, but the work of a much smaller rodent--a Woodland or Pine Vole, Microtus pinetorum (file photo at right). 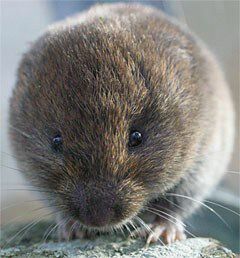 These voles (sometimes confused with moles, which aren't rodents at all) are mouse-sized with short tails but are seldom seen because they spend their hours digging tunnels just below the surface of the ground. Voles use leaf litter for camouflage and sneak up on unsuspecting shrubs and saplings, biting into the bark with their little tiny teeth--see tooth marks on the stub in the photo--and eventually girdling the trunk. This kills the woody plant, of course, which makes voles the bane of landscapers and orchard men alike. At Hilton Pond Center several young Flowering Dogwoods were damaged years ago by Woodland Voles; the trees survived only because we removed all mulch and dead leaves from around the bases of their trunks. When trees do die at Hilton Pond Center we try to salvage them when we can--one of the joys (and obligations) that comes with heating our old farmhouse with wood. Sometimes we can't use all the wood--even our hydraulic splitter isn't strong enough to split every trunk--in which case we simply let the tree lie where it fell. 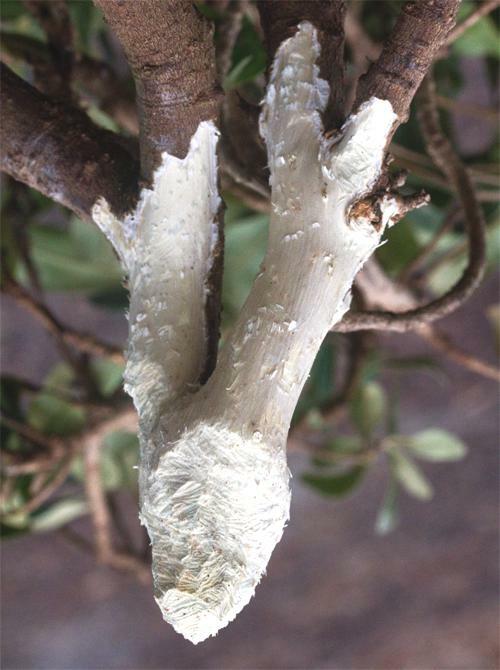 When this happens everything from beetles to termites to bacteria and fungi attack the tree's cellulose, eventually decomposing it to the point where it almost seems to melt into the soil. Among the Center's most common decomposers are several varieties of Turkeytail Fungi (above), so named because multicolored banding along the visible thallus is reminiscent of that on the tail of a Wild Turkey. One might not think that a fungus would brighten up a mid-winter day, but the Turkeytail certainly does. We suppose that if the viruses that have been attacking our cells had been a little more destructive we, too, might have ended up on the forest floor as food for decomposers. To be honest, we're glad our immune system and the wonders of modern medicine appear to have won this latest battle and deferred our eventual fate, at least for a while. That being the case, we intend to keep looking around at Hilton Pond for natural miscellany we can observe, photograph, and write about in the hope you'll do the same wherever you might be. --Although Punxsutawney Phil, the famous Groundhog from Pennsylvania, did not see his shadow on 2 Feb and predicted an early spring, our new friend Hilton Pond Harry (a White-footed Mouse) arose to brilliant sunny skies and cast a wicked shadow--indicating six more weeks of winter for the Carolina Piedmont. Who you gonna trust? --This year's Groundhog Day was also the 13th anniversary of our first on-line installment of photo essays entitled "This Week at Hilton Pond." --4 Feb was the 223rd birthday of the Rev. John Bachman, founder of Newberry College. He was also one of South Carolina's greatest naturalists--as indicated by John James Audubon naming a warbler and a sparrow for him. He was a man of science and of the cloth who saw God in nature and nature in God. --10 Feb began the Lunar New Year of the Snake. Let's hear it for serpents such as the Common Kingsnakes and Black Ratsnakes and even Copperheads that occur at Hilton Pond Center. --2007 must have been a good year for American Goldfinches. This week we recaptured two we banded locally that year, including a male now in his eighth year and thereby the oldest of his species ever recorded at the Center. --The Center's Yearly Yard List of birds seen on or over the property in 2013 stands at 32 species as of 12 Feb.
--Last week's photo essay was about Peromyscus mice, some of which are liable to invade human dwellings. It's archived and always available on the Hilton Pond Center Web site as Installment #562.